We no longer live in fear. Fear that our glass French press carafe is going to shatter into a zillion pieces. 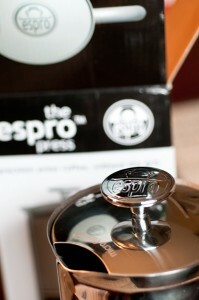 We now have the Espro Press. Some back story first: We gingerly bathed our glass carafe for weeks after noticing a hairline fracture near the spout. But one day last week, the little bugger gave out. *sigh* So instead of giving up on coffee that day, my ingenious husband rigged a “French press” out of coarse grounds bound in cheesecloth steeped in a Pyrex cup of boiling water. It worked, but it was a rather messy endeavor. I posted the makeshift coffee contraption on Facebook, lamenting the death of our beloved Bodum. And what do you know? Our good friends – and java fiends – Julie and Dave identified with our plight and offered a spare press. The stainless steel Espro Press. This is one special coffee pot. 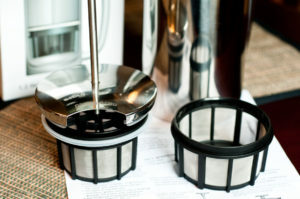 The difference lies in the double filter, which ensures that virtually no grounds wind up in your cup. It’s also made of double-walled stainless steel that keeps the coffee warm. And though the spare press has a dent on the outside, it doesn’t affect its function. Can’t say the same for a glass press, can ya? Now here’s the rub: The 30-ounce Espro costs $99. Plus shipping, depending on where you buy it. Is it worth the cost? Considering I spent $20 on my first glass press, $40 on my next glass press and it would cost around $20 to get a replacement carafe, the Espro would only cost me about $20 more overall. Nevermind all of the waste caused by the other presses. How does the coffee taste? Delicious. Better than our glass carafe press? Um…sure? Honestly, we’re not discriminating enough to know the real difference (nor did we taste them side-by-side), but the Espro makes a smooth, satisfying cuppa if there ever was one. What’s more is that we now use just 3 tablespoons of coffee instead of 4 to make a similar-tasting 16-ounce pot. 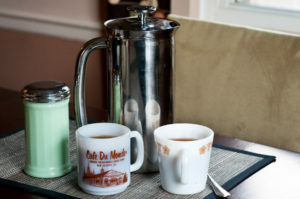 Do you use a French press? What’s your favorite brand and brewing method? I have cracked a Bodum, too! 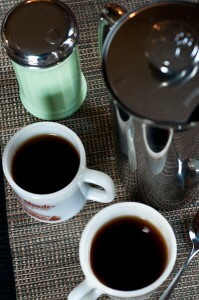 Now I’ve resorted to a coffee maker–gasp!–but I do grind my own beans. French press takes the cake for flavor though. It makes coffee super strong. Likey.